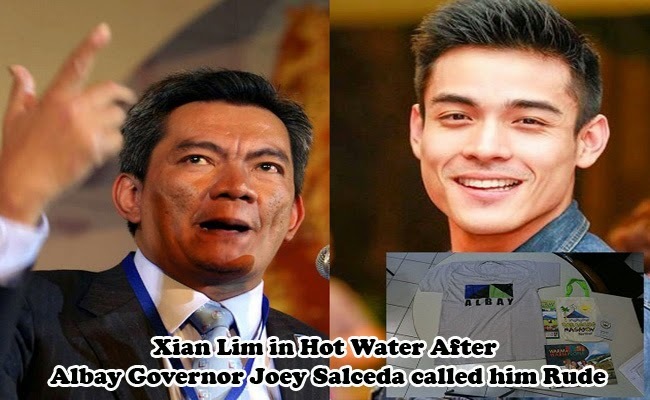 Xian Lim seemed to be in hot waters after Albay Governor Joey Salceda called him rude and accused him of hurting the feelings of Albayanos in an event on February 19, 2015. The accusations had been denied by the actor and said that the reports circulating around online had been wrong. During Tsinoy Albay Festival, Atty. Carol Sabio-Cruz, the chief of staff of Gov. Salceda, personally met Lim and welcomed him to the event. She said during the interview on ABS-CBN news that Lim could not say that she was a nobody since she had clearly introduced herself. After the introductory, she had presented Lim the shirt and coffee table book usually given to the region’s guests. She was not even given the chance to unfold the shirt as Lim had allegedly waved away the shirt saying he did not want it. She said that she had then offered the the coffee table book but that too had been waved away. Cruz also recounted Lim telling her that he was not there to promote Albay. Cruz had shared her experience in a group chat which Salceda was also a part of. Salcedo shared the story of the encounter after the event. He also shared that Lim was paid P350,000 for the said event and they had treated him as a guest only to be disrespected. Lim had posted his side of the story in his Twitter account. He shared that the story going around the internet was not right. He said that he never said that he was not there to promote Albay. He had explained that he had refused to wear the shirt as he was concerned that it may be conflicted with his clothing endorsement. Finally he apologized for the misunderstanding. On the other hand, Cruz said that she did not even asked him to wear the shirt. Salceda seemed not to believe the actor and not ready to give his forgiveness.